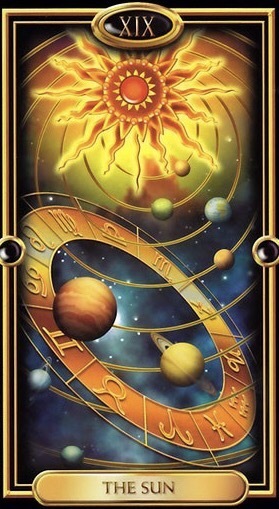 This image of the Sun card has always been one of my favorite cards ever, from the Gilded Tarot, which is one of my favorite decks ever. It conjurs up thoughts reminiscent of the 90’s TV classic, ‘Third Rock from the Sun’. There we are Mother Earth, dependent upon this fireball of a being, to provide us life on a daily basis as we orbit. The Sun is what brings us our vitality, not only is it life-giving, but it imparts feeling of positivity, when one is exposed to its rays in safe amounts. Conversely, without it, it is very easy for one to be down and depressed. When the Sun shines on you, you are basking in its favors and good things are bound to happen. It is even possible to have a little fun along the way. Today has a very positive vibe, so be sure to soak up your little slice of sunshine if at all possible. And, remember, it never hurts to add a little sunshine to the day of all you encounter. This entry was posted in Card of the Day, General Tarot, Patreon, Readings, YouTube Videos and tagged Card of the Day, Guidance, Path, Reading, Sun, Tarot.